Preheat oven to 220ºC / 180ºC fan-forced / 400ºF . Lightly oil a 9cm x 19cm (4″ x 8″) loaf pan or bread tin (if you don’t have one line a large roasting pan with baking paper) and set aside. Combine all ingredients in a large bowl and mix thoroughly with your hands. Tip into prepared loaf pan or shape into a loaf and place on prepared roasting pan. Bake for 45 minutes, basting (spoon over basting sauce) every 15 minutes. Remove from oven. Cut into thick slices and serve with Cumin Carrots and green vegetables. Use lower GI bread such as wholegrain or wholemeal (stale bread can be used here). Thoroughly toast slices and allow to cool before tearing into chunks and feeding into kitchen whizz. Process to desired crumb size. A good idea is to made double and freeze half in a well-sealed plastic bag. Worcestershire sauce is a great secret ingredient. My mother used to use a lot and I have rediscovered. 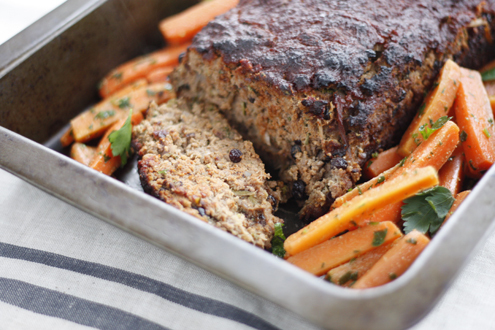 It works really well in meat loaf and the cumin. Good to see it featuring. Great recipe. Hi K. Yes it’s been a major discovery for me. I previously only used it in Bloody Marys. How the times have changed! Hi Daniella. Like you I’m a total convert now. I think that previously there was a tendency to overcook meat loaf so it came out dry and crumbly (‘ewwwww’). The great thing with this recipe is the grated veggies/ moist currants and basting help keep it tender and juicy. Despite trying many times to be one with the Brussel, I just can’t. If you have a good recipe, please let me know. They only one I’ve heard of (which is unmentionable here on GDRecipes) is the deep-friend Brussels at Sydney restaurant Porteno. But you didn’t hear that from me. Hi I am loving your recipe ideas! This is my 3rd pregnancy and have had diabetes each time, after nearly 15 weeks of the Low GI diet I am getting very bored :( so I now have some lovely looking recipes to try! What would a currant be referred to in the USA? I can’t find it in the local grocery store. In Canada, currants are just currants. I get them dried at a local bulk food store along with all the other dried fruit. They look like miniature raisins. :) I’m assuming, based on the need to soak them, that the recipe refers to dried ones, not fresh.